When it comes to the distribution of dividends to investors, Portugal was able to outperform all of its European peers, and it is now the bi-Champion of the European dividends challenge. For the second year in a row, Allianz Global Investors has placed Portuguese companies as those showing the best dividends in Europe. At an international level, it climbed up one spot, only being outperformed by Russia, which is the country in the world where shareholders get the best dividends compensation. Portuguese companies’ average dividend yield stands at 5.36%, a ratio which compares the amount that will be paid by the company with the value of the share, dividing the dividend for the face value of the share. The higher the tax is, the more attractive the dividend is. 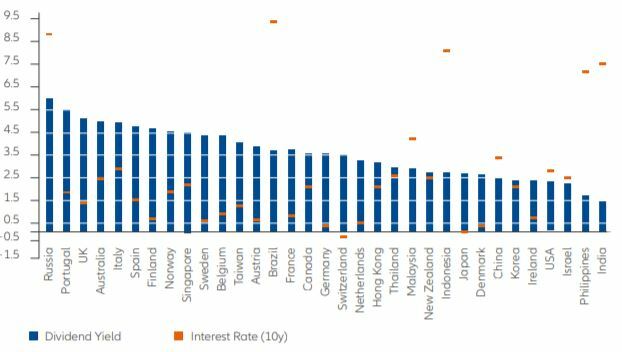 This rate is the highest witnessed over the course of the last three years (4.4% in 2017 and 4.5% in 2018), and they stay well above the European continent’s average dividend yield. “Historically, European companies have always been big supporters of dividend compensation, following up on international standards. By the end of 2018, and in the 45 years after 1973, dividends yields for European shares stood on an average of 3.8%”, Allianz notes, highlighting that the average dividend yield rate stood at 3.2% in North America, while it stood at merely 2% in Asia-Pacific. In terms of the European market, Portugal is followed by the UK (4.97%), Italy (4.79%) and Spain (4.65%). The only dividend yield which is still more attractive than that found in Portugal is the Russian stock market’s dividend yield, at an average rate of 6%. At the European level, Allianz is forecasting €350bn in dividends will be distributed by all investors, a value which represents an increase in comparison to that of other years. In comparison to the dividend compensation value registered last year, there is a €16bn difference, accounting for a 4.8% increase. Also, Allianz considers this to be a positive sign for investors, as the political uncertainty and feeling of distrust lived in the European continent are somewhat balanced with these high levels of dividend return in 2019, reminding as well that during the last 45 years, dividends represented 40% of the total European stockmarket income.